SEATTLE, Nov. 26, 2018 /PRNewswire/ -- Boeing [NYSE: BA] and Turkish Airlines today announced an order for three 777 Freighters as the flag carrier of Turkey continues to soar on record financial results and double-digit passenger and cargo growth. 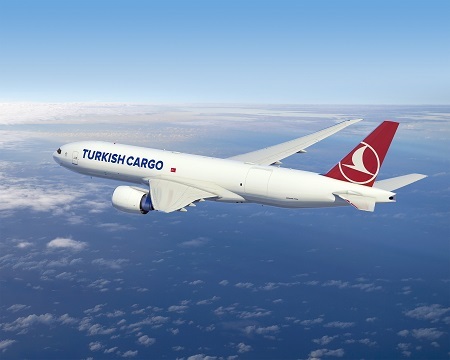 The order adds more of the long-range freighter to Turkish's fleet as the airline pursues its goal of becoming the world's largest cargo carrier. Based in Istanbul, Turkish Airlines carried approx. 70 million passengers last year. The national flag carrier of Turkey currently operates direct flights to 304 destinations in 122 countries, as the only airline that flies to more countries and international destinations in the world. Turkish Cargo, the successful sub-brand of Turkish Airlines, is the world's fastest-growing air cargo carrier considering the cargo volumes, new flight destinations, and expanding cargo fleet. It serves customers in 124 countries, including two more countries besides the ones included in Turkish Airlines' flight network.